With rustling foil and squeaker. 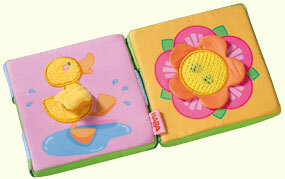 Thanks to the magnetic flipping effect these first fabric books will be real clutching fun for babies. The cute illustrations and elements to listen to or fumble for, guarantee even more pleasure. Made of foam and cotton/polyester. Measures 4.5" x 4.5".